THE mineworkers unions have expressed gratitude to President Edgar Lungu for the manner he has intervened in helping mitigate the impact of job losses among the retrenched Mopani Copper Mines (MCM) miners who have been given some tax relief by Government. Mineworkers Union of Zambia (MUZ) General Secretary Joseph Chewe said the retrenched miners have all been given some tax relief by the President who has stopped Government from taxing K18, 000 ex-gratia given to MCM employees declared redundant in the wake of the current economic down-turn. Mr Chewe said this at a MUZ, National Union of Miners and Allied Workers (NUMAW), United Mineworkers Union of Zambia (UMUZ) and Zambia Union of Nurses Organisation (ZUNO) joint press briefing in Kitwe yesterday. The MUZ general secretary who was giving the routine updates on matters surrounding the affairs of miners, said apart from the pension money of two-month salary pay by the number of years of service, the unions also negotiated for an K18, 000 ex-gratia for each of the retrenched miner, which they had asked to be a stand alone payment. He said to this effect, the unions asked President Lungu to allow the retrenched miners to be paid K18, 000 without Government taxing the money, as a way of giving the ex-employees some form of relief. 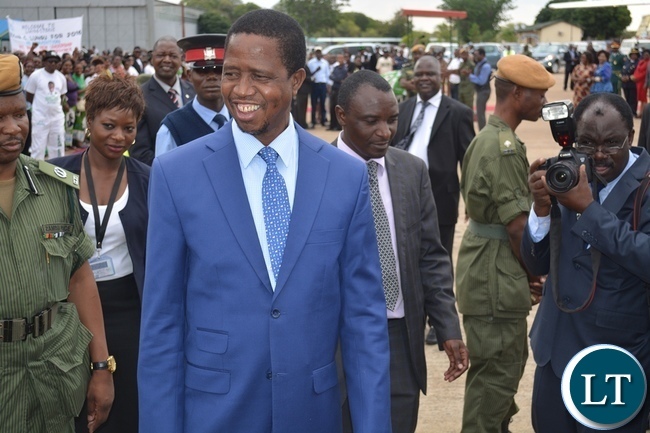 “President Lungu responded favourably to this because he is sympathetic and he has asked the Ministry of Finance to allow the miners to each receive K18, 000 without the money being taxed,” he said. Mr Chewe said furthermore, the unions, in seeking a sustainable way of assisting the retrenched miners, asked Government to help empower victims of mine redundancies with land for agriculture purposes. He said the President responded positively to this by directing district commissioners for Kitwe, Mufulira and Chingola to ensure that they identified farming land for the retrenched miners. “We are grateful that the president has responded to the unions’ cause and the good thing about this is that this will resonate well with Government’s programme for diversification of the economy,” he said. Mr Chewe appealed to Stanbic Bank to consider having a humane face over the retrenched miners by not subjecting them to a 100 per cent loan recovery. He was aware that while some banks such as Standard Chartered were doing a 50 per cent loan recovery, Stanbic had opted for a 100 per cent, making some of the retrenched miners go empty-handed. NUMAW president James Chansa castigated arm-chair critics who have been critical about the interventions put in to help mitigate the impact of the global challenges such as low copper prices on the mining sector in the country. “The unions have been badly affected because they have lost income and so is Government which has lost revenue in form of taxes,” Mr Chansa said. UMUZ president Wisdom Ngwira urged all the retrenched miners who would be fortunate to be empowered with land for agriculture to seize the opportunity by making good use of it. They should also be grateful to PF for loosing theirs jobs! just imagine! this joseph chewe thanking PF for job Cuts! i thought people on the copperbelt were Sharp! but no i was wrong!!!! Lies, lies & just lies. Ex-gratia payments have ALWAYS been tax-free payments. The same applies for funeral grants, because they are ex-gratia payments. No matter how large the amount, they are always tax-free. Lungu should be ashamed of himself for trying to buy votes by cheating the miners that he intervened in their plight for the sake of 2016 poll. Come what may 2016 uleya! If I understand correctly this is $1800 they are thankful for and in ful praise for Kaminamisa Lungu? How far will this take them? Another populist campaign gimmick. We are not happy with job losses but when it comes to taxes everyone must pay their fair share. Let us all be exempt from taxes at tge moment as the cost of living is unbearable. Guys the amendment PF want to enact are simply a dodgy move to weaken opposition parties and eventually bring back one party system. This is how Kaunda did it. Zambians watch out and plan demonstrations to stop this madness!. Otherwise you will be endorsing a slow but sure walk into slavery similar to Zimbabwe. Call these MPs to consult with you on these issues before allowing them to make changes. He is grateful for the bribes he has received from PF to go easy on them. You want Lungu to give them jobs. How when Mine owners are saying copper prices can’t sustain their ops. It’s funny that a union leader does not know that ex-gratia is tax free or he is stupid. You lusakatimes also advise these guys before you publish false information. campaign strategy and another blanket onto the faces of poor Zambians. Either that or it was a tip from somewhere, am so tired of these thieves. But what is K18,000 with the prevailing economic hardships? We told these guys from the Copper belt not to vote for Mr Lungu. That amount cannot even pay for a student at CBU for one academic year. I am sorry to say this but it has to be said, they are reaping the sweats of their labour. People were moving half naked in the streets on the copper belt to express their happiness when Lungu won the elections. All UPND SUPPORTERS ARE DULL LIKE THEIR LEADER.FYONSE IMWE NI BITTERNESS SHAME. Farting in public as usual or just showing inbred 1mbecility? I thought the first K30,000.00 should be exempted from being taxed in any case, whether he gave that relief or not? Useless unions. Chiluba was the last true union leader. Imagine and that time it was a one party state…now you simply have job seekers! This Ex-gratia payment is supposed to be tax free. Check with ZRA. The UPND bloggers are a bitter lot wanting to take advantage of the miners situation on the C/B to try and win cheap popularity as if they have the power to influence copper prices on the world market. Even on the power deficit,they behave like they are able to create water and fill up the Kariba dam.I fully support someone who challenged them to urinate and fill up the dam to produce power.Their criticism is always hypocritical. @jembo, take heart, my friend, that is why it is said politics is a dirty game. Sata was an expert. More money in your pockets, ruling by the 10 commandments, etc. @Jembo open your eyes PF and Lungu have failed weather you like it or not.There is need to user in leaders who will fight climate Change head on and implement policies that will help grow Zambia’s economy.Kariba dam issue is an connected to climate change and the lucky of Pf responding to it in time.We also know that there is the new turbines bought from china are not perfoming well and they consume a lot of water.Thats what corruption does.Lungu and the corrupt PF government have failed full stop. Have people just woken from a 6 month coma. It is well known and accepted that poor rainfall had nothing to do with the problems we are facing with power. Someone authorized the wrong turbines into the dam and had to use more water to get electricity, either the same person or someone else then authorized Zesco to exceed their allocated amount of water usage, this resulted in the level of water dropping dramatically and hence loadshedding. The travesty is that we don’t know who this person/people are and they have never been made to account for their actions. They are still collecting their pay, live in a company house, drive a company car, collect wonderful financial and non financial benefits… all paid for by you and I!!!! @Whisper, have you heard of selective listening? According to urban dictionary: one possesses this quality when they hear only what they would like to hear. Guy Scott said it but since it wasn’t what people wanted to hear they resorting to believing Kambwili who talked about “load shedding in the region.” After all problems are becoming global. Lol. Dependency syndrome is what I see the UPND chaps and their failed leader HH are trying to the miners. The job losses is very regrettable but it is inevitable given the global outlook. Already, President Lung has shown leadership and guidance in this rather unfortunate event. Most of you chaps in UPND dont even know how the Copperbelt looks like and operate! How does someone who has been a miner all his life suddenly turn to aquaculture for survival? Chile produces more copper than Zambia. Question is how many of their mines have had to shut down or retrench workers on account of the fallen copper prices? We were taught a long time ago by ZCCM to possess portable skills that could be used for survival,..a long time ago! So we have been doing ‘other things’ for quite a while now..Bad as this situation may look, it may produce the next Dangotes or Costain Chilalas..! Another venture these guys can go in is to start business groups by investing in fish farming which President Lungu has already recognized as one venture that can create employment and has high returns and ready market. So to my brother miners, come out of the box and start doing things differently. As you can see, the opposition especially from UPND and HH are rejoicing in your situation but be assured life is bigger than the mines, start being innovative. You are dull and probably so is your laid off uncle. Was HH the president at the time of privatisation, was he in charge of privatisation, did he have the last say??? You are the same kaponya PF thieves full of feaces for brains cheating miners that their redundancy pay is made tax free by lungu when in fact it made so by the law. Next you will want to charge the layedoff miners a fee for making the redundancy tax free. Thieves. MUZ members need to elect smarter leaders..their subscription is being wasted on empty tins!! Lazy Lungu shouldn’t meddle with tax…a hard working person would know it importance.This why the likes of Meembe assume they can get away without paying it. Ba upnd and ka hh, you wanted to use the mine situation as a point to campaign against the pf government shame…You useless mps voted against the constitution bill which you also wanted to use against the government. Upnd party full of devil worshippers, hh go pay and treat your farmer workers well, stop pretending to the Zambian people that you are a good person as a matter of fact you are wicked. Do you know how “Bill” becomes “Act”? If you know, then your comment is evidence of your acute “cadreism”. If you do not know, enjoy your ignorance. I was laid off last year to pave way for new terms of hire, the first K10,000 is tax free, then the rest is taxed at 10% – in essence they are being grateful for K800 only. Most people (even the unionists) are cheated because they don’t read their conditions of service and tax laws. Sata used those tactics which you condemn and they landed MMD in the opposition. Continued. Mind you ,the Zambian people will no longer buy false promises of 90days,more money in your pockets,creation of 500,000 bla,bla ,bla. Miners were supposed to be prepared psychologically on the impending job losses.It is not easy because it has effects on mental beings of workers.The Mine Workers Union of Zambia would have engaged a psychologist to prepare miners of the eventuality to come.Most of them literally depended on mining for their survival,now,forcing them into farming will be like taking the proverbial horse to the well and force it to drink water. I hope and trust they will come to terms with it.Otherwise,it is a bitter pill that has been forced on their throat. PF has failed. The best they can do is to amass wealth so that when they start going to the courts after removing them, they will have something for the lawyers, the judge, prosecutors, well Wishers and the police. And if they are jailed, something for their family. As for Kambwili, councils sold houses to the sitting tenants. Therefore, when we take over government, his properties in Luanshya will be repossessed by government and given to the councils as a housing initiative. Zambians generally have a very short memory but in this case, the short memory is bound to work against Lungu. By the time Zambia goes to the polls, these miners will be “pululu bakeni sa lukupwe – they’ll be dry with hunger”) and none will recall this so called gesture of his. Besides, is this not the same money he already spent hiring dancers to accompany him to the UN? Mambala Kaminamisa iwe! And ECL used his hard earned currency to build clinics? Get over it. Enjoy the power as long as it lasts. This is what you and the theives in PF fail to understand, one needs to take money from thier pockets or to borrow money to sustain the economy, the economy should be self sustaing. I know this is difficult for you “manee in our pockets in 90 days ” kaponyas, but that us how a country should function. These are the most corrupt union leaders in Zambia the nation has ever had. Is there anything to thank government for when it is not you but workers who have lost jobs? Both these fipuba unionists and the government were oiled by Mopani to support its scheme to retrench workers. Further it is not the union’s job to protect jobs of its members but government’s because government brings in investors who should be taught concerning employment and labour laws. Sadly these uneducated unionists accepted blame for what government should have done. Fipuba ifi fi mafi byaba Union. Ifwe amachito nayapwa and you are thanking each other (with your government) for cutting corrupt deals. We know you and come 2016 our voices shall be well heard by the ballot. Kwaliba? As UPND everything that you spew out must be negative? Coming to UPND cousin the Past news (or toilet paper as Mmembe’s “newspaper” is known in many circles), this report is directly quoting leaders of all the mine unions, clearly they understand the economic challenges and what led to retrenchments. Contrast this with what the Past news wrote yesterday, one would be forgiven for thinking that they live on Mars with fellow aliens, and have never visited earth or Zambia particularly, but they are at Bwinjimfumu in Lusaka and they are supposed to be Zambians for Christ sake!. Bravo. A well and perfectly written comment worth the extremely low level of intellect of certified 1mbecile which will sell his own mother for temporary financial benefit. Somehow you are forgetting that Post or Past was and is still integral part of Political Failure laying and deceiving DNA. Edith Nawakwi was Energy Minster how many alternative energy projects did she propose or build. HH helped to sell our mines. Yes he was doing his job. But as a Zambian and economist did he ever advise the government of the day on which was the best sectors to reinvest the money in. Or maybe his focus was buying ingombe(cattle). It’s global recession….it’s china’s fault….it’s HH fault…..it’s the rains fault….it’s the nawakwe fault…..it’s the low price of metals fault…..it’s the IMF fault…. In the mean time who will you blame for ZRS failure, ZAMTELS failure, NCZ failure, the Zambian pipo paying for the most expensive rds in the world ??? the same way your pf doesnt take advise the same way it was during his time. According to what I know, a retrenched person is entitled to a tax free K10,000 and then the rest is taxed at 10% meaning these guys are grateful for K800 tax relief – too many morons out there! Be grateful that you are not amongst the retrenched miners….. I would not be grateful for $80 relief when am being laid off either, would you Mr Chibe? lol… say that when you are laid off which probably won’t happen…..Anyways, you and I can thank God that it won’t probably happen as we still get unemployment allowances in our host countries. @LOL (Lots f Loadshedding)….. I get your point. Misunderstood what you were communicating. Zambians have amazingly short memories. A few weeks ago, the same fella, Lungu, said he would not allow mines to retrench people, zambians have forgotten. Now they are applauding him for allowing the retrenchments and giving them peanuts in some tax relief. This is so farcical. PF are a bunch of pure jokers. In China a ship maker who had 8000 employees went belly up and all the employees lost their jobs. and consequently the companies that depended on the ship company also closed down. How many jobs do you think were lost? Lekeni ba Lungu ba teke. He can not prevent all things not in his liking to happen. What does Mathews law state? IT IS PATHETIC. TYPICAL OF ZAMBIANS, WHEN SOMEONE STEPS ON THEIR TOE, THEY SAY THANK YOU TO HIM FOR HURTING THEM. IT IS BIZZARE! Don’t these Banks take insurance cover on these loans? If my memory serves me correct, they use in-house insurance agencies and premiums are paid in full (deducted from loan amount in advance). So, if the miners are now incapacitated, why cant the banks claim from insurance? Ex Gratia is and always been tax free under the Zambian tax law.